On Saturday, December 1st, snow was on the ground when I woke up! I went out and played in it before Papa and I drove to Oranjeschool. 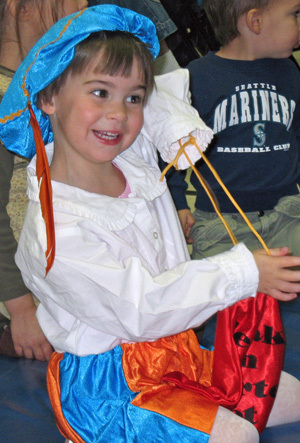 I dressed up like Zwarte Piet and wore my turquoise and orange knickers, a white blouse, and a feathered cap [right]. There was a big party in the gymnasium. All the children sat on the floor, and Sinterklaas came and sat in his big red chair and talked to us. We sang songs, and then the Zwarte Piets handed out little gifts. Later that day, Mommy and Papa took me to the Sinterklaas party sponsored by the Holland-America Club in Lake Forest Park. I was so tired from the morning that I fell asleep in the car on the way there, so I missed the games before Sinterklaas arrived. I did have enough time to make a tissue paper Zwarte Piet hat, but I liked my own cap better. I also liked the speculaas cookies and apple juice. When Sinterklaas' boat arrived at the dock, it was still snowing. I watched through the window because it was very cold outside. He came through the door covered in white and surrounded by a noisy, pushy throng of kids. I didn't like the crowds, so I stuck close to Mommy rather than sit on the floor and sing songs with the other children. Before Sinterklaas left, I went up to say hello, and Mommy took a picture. He was very stern. For a week, Cameron and I left our wooden shoes on the family room hearth, and Sinterklaas came each night and put a few candies and little toys in them. The first couple mornings I forgot about them, but after that, as soon as I awoke I ran downstairs to check my shoes! Then on December 5th, we had our special Sinterklaas dinner: berries and whipped cream on waffles. When dinner had finished, Sinterklaas knocked on the front door. (Just like last year, Papa was in the bathroom.) 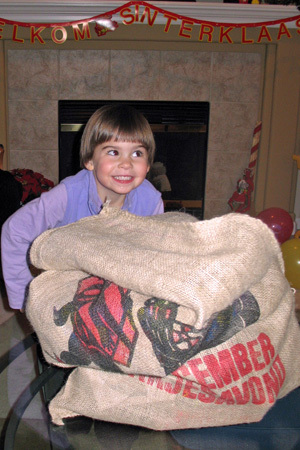 Cameron and I ran to the door, and as Cameron lifted a big burlap bag full of gifts, I leaped up and down with excitement! Everyone gathered by the fire in the family room, which was festooned with a "Welkom Sinterklaas" banner and other December 5th decorations. I had to get my arms and head way into the bag to reach the gifts [left]. Everyone received at least one poem (I got one in English and one in Dutch), but they weren't as interesting to me as the candy and gifts. Cameron and I got candy and a chocolate letter. Mommy, Papa, and Cameron each received one gift; I helped open them all. I also got two games: Cooties and Hullabaloo. Mommy, Papa, and I went to visit Santa at Nordstrom's in Bellevue Square. I was really excited to see him, and it was hard to be patient in line when there was a boy ahead of me who was afraid of Santa and wouldn't sit on his lap. 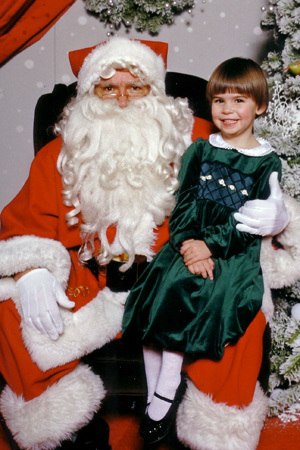 Finally it was my turn, and I skipped right up to Santa and got onto his knee. I smiled for the photo, and then Santa asked me what I would like for Christmas. Very softly I whispered, “Logs.” I hoped he knew that I meant the Lincoln Log set we'd seen just an hour before in a nearby toy store. Then Santa gave me a candy cane, and I said, "Thank you" and "Merry Christmas." Santa put his arms out, so I gave him a very big hug and waved goodbye. 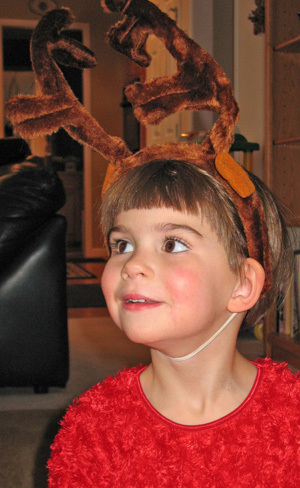 Santa told Mommy that I was a very sweet girl—and after I ate the whole, sticky candy cane, I sure was! We did lots of fun things in December to celebrate Christmas. 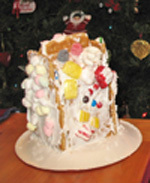 One of my favorites was making a “gingerbread house,” which was actually graham crackers glued with frosting to a 1-pint milk container. Mommy spread most of the frosting, and I stuck on as many candies as I could possibly fit on all four sides and the roof [top left]. 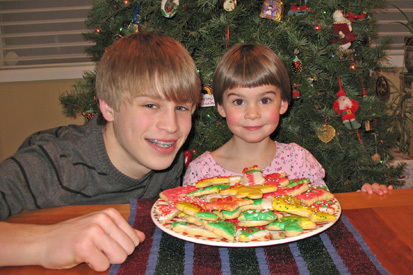 Mommy also made Christmas cookies that Cameron and I decorated with frosting and sprinkles. Cameron decorated his like works of art; I liked sampling the frosting off each cookie as I spread it on. The finished cookies [bottom left] tasted delicious! Of course, we put up a Christmas tree. After Mommy and Cameron strung the lights, I helped decorate by putting lots of unbreakable ornaments along the bottom. Mommy and Cameron did the rest, and it looked beautiful. We all had hot chocolate with marshmallows when it was done. One day Mommy took me to Studio East to see a special holiday show, “Twas the Night…” It was very funny, and I loved the singing and music. We also drove at night to see two different houses decked out in fancy lights that were synchronized to Christmas music. One of them had 54,000 lights! For Christmas Eve, we went to Grandpa's house in the late afternoon. My cousins Jenny and Erika played with me, and I had lots of fun running around with them and the three dogs in the house. For dinner I sat at the kids' table with Cameron, Erika, Jenny, Jeff, and Kyle (those last two looked way too big to be kids! ), but I didn't eat much. I was too excited. Next was the kids' musical “entertainment.” Cameron played "Hallelujah" on his trumpet, Erika and Jenny played the keyboard, Jeff played his oboe, and Kyle the guitar. 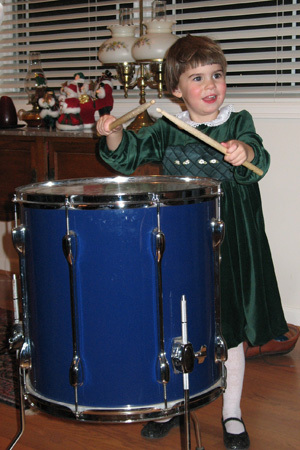 Uncle Buzz brought a big drum to accompany the boys, and I tried it out [right]. But all the commotion got to me, and when I had a tantrum, Papa put me in the upstairs bedroom until I calmed down. Then it was time for presents! I liked helping Jenny pass them out from under the tree, except that I didn't know who everybody was and kept giving gifts to the wrong person. Everyone opened gifts all at once, and it was noisy and messy! My gift from Bonnie and Grandpa was a hand-sewn, yellow princess dress with a swirly skirt and even a crown and scepter. Erika gave me a My Little Pony play boutique. I didn't get to open the package until Christmas Day, but it turned out to be one of my favorite gifts. When we left Grandpa’s after 9:00, I was very tired. Still, I didn't want to go to bed; I wanted to play with my new toys. And I wanted to see Santa. But it had been a big day: as soon as my head hit the pillow, I fell asleep! I woke up at 8:45 on Christmas Day; I think Mommy and Papa were glad to be able to sleep in! Right away, I wanted to go downstairs and check my stocking. I was excited to find that Santa had drunk some milk and eaten some bites out of one of my decorated cookies! It took a long time to unpack my stocking—I wanted to play with (or eat) each surprise as it appeared. 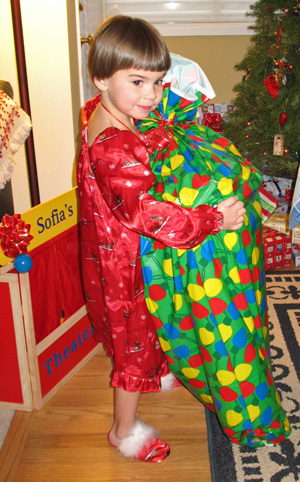 Then I opened my gifts from Santa [left]. He really did bring me Lincoln Logs! He also left a drum set, a puppet theater, and a Curious George doll. Even after I opened those presents, there were still a huge pile of them left under the tree. At 11:00, Papa left to pick up Grandma Joanie, and Mommy began cooking dinner. I played with my new things. Grandma and Cameron both arrived about noon—and it began to snow! I begged to go outside to make a snowman, but we still had lots of gifts to open and dinner to eat. We took turns opening gifts, and I played Santa's reindeer elf [right] and handed them out (with Cameron’s help). Everyone else let me help them open their presents if I wasn't opening my own. My favorite gifts were a My Little Pony balloon house, a bathtub “chemistry set” (a floating pallet with test tubes and tablets to make colored water), the Lincoln Logs, a Gearation magnetic gears board, a Magtastik magnetic building set from Cameron, and homemade play dough from Stephanie Priest. For dinner Mommy made roast beef, scalloped mushroom potatoes, green salad, cranberry salad, and dinner rolls, but I ate only a roll. I was too excited—and full of stocking goodies. After dinner, Mommy and Cameron drove Grandma home (the snow had already begun to melt), and I had a “quiet time” at home with Papa. For the rest of the afternoon and evening I played with my new toys, watched Rudolph and Frosty, and ate Christmas treats. What a wonderful day! 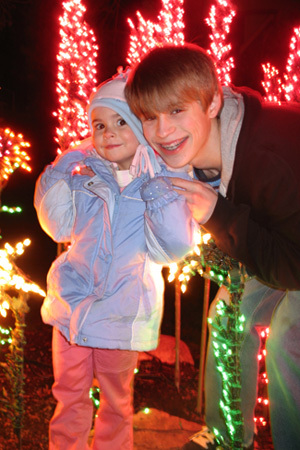 On December 30th, Mommy took Cameron and me to see the lights at Bellevue Botanical Gardens. We'd been waiting for just the right night, when it wasn't pouring rain. Last year I saw the lights from a stroller, but this year I walked all the paths (except when Cameron carried me on his shoulders). The lights were beautiful! I saw a lily pond with swans, gardens of flowers of all shapes and sizes, a giant spider web, a parrot, a slug, a lizard, butterflies and ladybugs, and even a 6-foot Christmas tree, all made of nothing but lights. It was really fun to walk in the dark through all the magical sights.